(L-R) Joe Baldelomar, Gift of Life Community Engagement Coordinator, Jonathan Simon, Advancing Black Leaders (ABL), Executive Director, Human Resources and JPMorgan Head of Student Strategy, Vilma Correia, Central Intelligence Agency Diversity and Inclusion Officer, Damian Rivera, ALPFA Inc. CEO, Anthony Chan, Chase Chief Economist, Gineth Pineda, ALPFA NY Director of Student Affairs and Morgan Stanley Risk Management Professional, Alexander Almonte, JPMorgan VP Strategic Investments Business Manager, Max Blandon, ALPFA NY Professional Chapter President, Russell Lowe, Gift of Life Community Engagement Coordinator. There is a cure for many blood cancers: a bone marrow or blood stem cell transplant can help give patients a new, healthy immune system free of cancer. 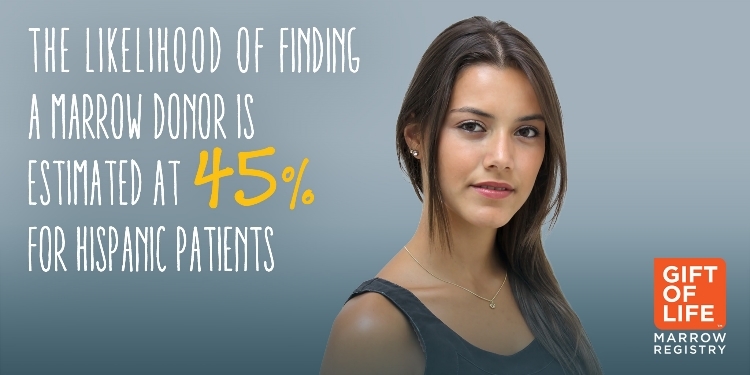 Yet 55% of Latino and Hispanic blood cancer patients cannot find a matching donor either in their family or in the worldwide marrow registry. Gift of Life Marrow Registry is on a mission to change this statistic: our goal is for every person to find their matching donor when one is needed. To help bring that change about, Gift of Life participated in the annual Association of Latino Professionals for America (ALPFA) National Conference in Las Vegas, Nevada. At the opening dinner on Monday evening Gift of Life Associate Director of Development Nick Hudson and Community Engagement Coordinator Joe Baldelomar presented a short video and explained how each of us has the power to cure blood cancer with the simple gift of a small amount of stem cells. Throughout the conference, Gift of Life had a swabbing table available where anyone 18 to 45 could volunteer as a potential donor with a quick swipe of a cotton swab inside the cheek. The partnership has continued throughout the year with Gift of Life’s participation in the 2018 ALPFA Collegiate Symposia in four additional locations, New York, San Francisco, Chicago and Dallas, explaining why the need to diversify the registry is urgent, and offering students the chance to swab. If a volunteer donor is found as a match for a patient in need of a transplant, the donor will be offered the incredible opportunity to save a life. Because the matching factors needed for a transplant are inherited, like hair and eye color, the best chance of a match is with someone who shares the same genetic heritage. Yet the low enrollment numbers for many ethnically diverse groups means that donors cannot be found for many patients. Volunteers donors from underrepresented ethnicities are needed to change these statistics and save more lives.